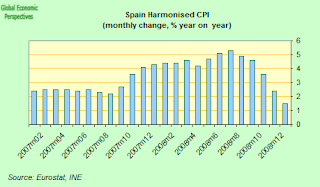 Why Spain's Economic Crisis Is Something More Than A "Housing Slump"
Spain's inflation (as measured by the EU HICP methodology) was around 1.5% (year on year) in December 2008, according to the flash estimate issued by the stats office (INE) earlier this week. This number only offers us an initial glimpse of the final HICP reading, but, if confirmed, it will mean Spain's annual rate of inflation has dropped 0.9% (nearly one full percentage point) in the space 0f just one month - since in November the annual rate was 2.4%. It will also mean that Spain's inflation for 2007 dropped its the lowest rate in a decade, down sharply from the 2007 rate of 4.2 percent. This is remarkable since Spanish inflation has generally been over the EU average for more than a decade now, and 1998 was the last year in which prices for goods and services rose as slowly as they did in 2008. And the big question is, just how much more disinflation is there now in the pipeline? Where, indeed, will this process end? Well, in order to dig a bit deeper into all of this in what I hope will be a practical and enjoyable way let me start by offering bit of free publicity for my local bar, which you can see in the photo at the top of this post. 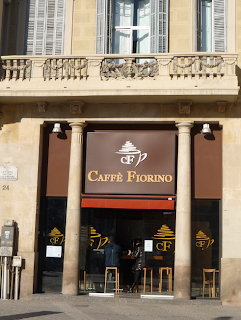 The bar is in fact situated in Barcelona's Plaça Lesseps (near to where I, myself, live, and also - for any of you who happen to visit Barcelona - directly en route for the Güell, or Gaudi, Park). The proximity to the park is obviously one of the reasons the chain who own the bar decided to put it where it is, since a significant proportion of the large number of tourists who make the daily pilgrimage to the park need to pass it on their way. Well, the point of this small publicity spot is not simply to offer them a shamefaced and willy-nilly promotion, but rather becuase I have singled out this little bar for a small experiment. Basically Joaquin Almunia, Pedro Solbes, Miguel Fernandez Ordoñez and I are in disagreement about something. Better put, they all agree with each other, while I find myself in basic disagreement, since they hold that Spain will see very low inflation in 2009 but not outright wage and price deflation. Of course, the devil may be in the details here, since if we are talking about the whole year average, then they may well be right, but if we are talking about the trend, then on my view we are heading for negative price movements - and over a number of years probably - and the only real doubt I have in my mind is when this downward movement will start. Hence my small litmus test. Basically I am going to take this bar as a test case, and in particular I plan to track the price of one particular product - their café con lleche (cafe amb llet in Catalan, café au lait for those who prefer the French version, but NOT, definitely not, the badly translated "milky coffee" - or coffee with milk - in English, since the art of this particular beverage is most definitely in the making). 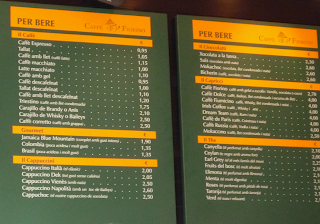 Now for those of you who can read the price list (below, click on image for better viewing), the price of a café con leche in the bar is currently 1:15 euro (which isn't expensive if you consider the bar, its location, the quality of the coffee they serve - very good - and the level of prices generally in Barcelona). This price is already news, since they did not raise it on 1 January 2009, a move which has all too often been a custom here in Spain. 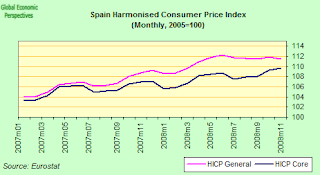 So at least prices are more or less stationary now in Spain (or at least prices in the private sector are - see below). But I expect more. I expect to see these kind of prices fall, and keep falling, and it this process we will be following here on this blog as we move forward. Now just to be clear where we are at the time of speaking, what we have in Spain at the present time is a strong disinflation process - not outright deflation. If we look at the index chart below, we will see that the general HICP index is not only stationary, it has been falling since July. Now this drop is largely the result of a sharp falling back in food and energy prices, and this is not in itself deflation. If we look at the performance in the core HICP index (taking out the "volatile" food and energy prices) we will see that the position is a lot less clearcut, since in fact the core index has continued to climb - following the line of the inbuilt inflation momentum - and has only started to steady up in the last couple of months. So my argument is that the disinflation which is being produced by the negative energy price shock, in the context of very, very weak internal demand could in fact produce a negative feedback cycle of price reductions which extend well beyond food and energy. There are two great obstacles to this downward movement, one is the existence of collective wgae bargaining structures which enable wages to rise when prices rise, but do not necessarily allow them to fall when prices fall - but it is inbuilt into my argument that the shock of demand contraction is simply going to be so strong over the coming 12 to 18 months that the ability of these agreements to withstand it in their present form has to be brought into question. The issue is, just how far and how fast are unions and government prepared to see unemployment rise before offering some sort of response, because this is just what the impact of these asymmetric wage rigidities will mean, very substantial pressure on employment as more and more companies are pushed towards bankruptcy. Of course, the "get out" may be the "pagos extra" (additional payments), which may simply become less frequent and less substantial. We will see. The second rigidity is constituted by the so called "administered prices" - basically those prices which are controlled or authorised by a government agency in some shape or form or other. One area where the role of administered prices is going to be important is in energy. The Spanish government only last week agreed to let power companies raise electricity tariffs over 20 percent over the next three years. The agreement is, of course, part of the government's plan to eliminate the large gap between what utilities charge clients for electricity and the cost of generating it, a gap which is known as the tariff deficit, and of course in the process attempt to reduce that "other" deficit, the current account one. Utilities will be allowed to raise the maximum tariffs they may charge some consumers by between 7 and 9 percent per year over the next three years. The industry ministry have so far introduced an average 3.5 percent rise in household electricity tariffs and a 2.8 percent increase in rates for small businesses, which come into effect from January 1. In return for permission to hike power rates, utilities will have to write off 2 billion euros of the tariff deficit, which sits on their books as a long-term government-backed credit. The government will guarantee up to 20 billion euros of tariff deficit and back the securitisation of the shortfall. The tariff deficit is estimated by Spain's energy regulator (CNE) to have swollen to 16.2 billion euros in 2008 from the 11.2 billion accumulated by power companies to the end of 2007. Now above you will find the first of two charts prepared by Japanese economist Richard Koo which I think will be useful to illustrate a number of points where we might find similarities between what is happening in Spain and what happened in Japan. The first of these points concerns the price of land (which is represented by the pink line in the chart - please click over image for better viewing). As you can see, Japanese land prices started to fall in 1991, and they really have not recovered to any significant extent to date (indeed land prices have now started falling again). 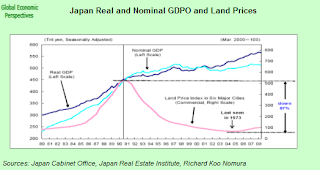 Now land has been the single biggest drag on Japanese asset prices since the early 1990s, and is one of the principal culprits behind all those years of protracted deflation, so I think people in Spain need to take note of this, and be warned. The second point to note is that outright deflation didn't set in in Japan till around the turn of the century, and what I am terming "outright" deflation is represented by the crossover point between real and nominal GDP. (Nominal GDP is GDP in current prices - ie the actual prices charged - real GDP is inflation corrected). Now as we can see, nominal GDP actually fell between 2000 and 2003, and this is a very complicated situation to handle, since debts retain their nominal values, while virtually everything else goes down. As a result, debt to almost anything up goes up, and this is the situation I fear we may see in Spain in 2009, or more probably 2010, where the economy contracts so fast, and prices also fall in a way that we get a sudden fall in nominal GDP. This, I think, would really be a nightmare scenario for everyone. 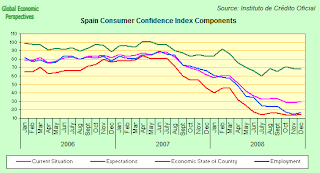 As might only be expected, with such a sharp deterioration in operating conditions Spanish consumers are not exactly feeling happy these days, and while Spain's consumer confidence indicator rose ever so slightly in Decemebr - to 48.9 from 48.7 in November (according to the latest report from the Instituto de Crédito Oficial, ICO earlier this week) - is is still way, way below the long run series average. The slight Decemebr improvement was largely due to a small increase in the sub component indicator for current economic conditions, but then it was December, and it was Xmas time. The current economic conditions indicator rose to 29.7 from 28.2 in November, while the consumer expectations component, on the other hand, dropped to 68.1 from 69.2. All in all we are still above July's historic low, but since confidence is still at a very low level that isn't exactly saying much. 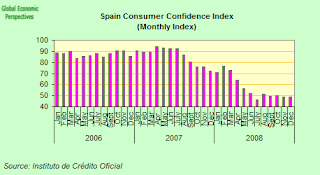 Spanish car sales fell 28.1 percent in 2008 over 2007, according to the car industry group ANFAC last week. This was the sharpest yearly drop ever, with Spanish car registrations falling 49.9% year on year in December, rounding out the year on the worst possible note - 72,377 cars were registered in December in Spain , down from 144,441 a year earlier. The car association reported that the drop was due to tougher financing conditions as well as the generally more difficult economic situation. "Job losses and shrinking disposable income are undermining consumer confidence and hitting car sales," Anfac said. "If market conditions persist during 2009, new car registration will have fallen by over a million vehicles, which gives us an idea of the gravity of the situation." 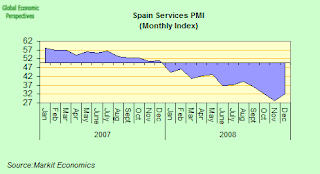 But it isn't only manufacturing and the key car industry which is now being weighed down by the crisis, Spain's services sector is also feeling the pressure, and the December PMI showed the sector contracted sharply one more time as activity, new business and the workforce all shrank at a pace second only to November's record declines. The Markit PMI, covering Spanish service companies ranging from hotels to insurance brokers, dropped to 32.1 in December - way below the 50 level where growth starts - and the second-worst reading since the survey began in 1999, following November's record low of 28.2. "The bad news in the Spanish economy just keeps on coming. The terrible PMI data for December were second only to November in their severity," said economist at MarkitEconomics Andrew Harker, "Any slight optimism seems largely based on wishful thinking, while it seems clear that conditions will continue to worsen in the first quarter of 2009 at least." The Spanish government, who last month announced an extra 11 billion euros on top of the previously announced 40 billion euros in tax cuts and state credit in an attempt to stimulate an economy whose health is deteriorating rapidly, continue to assert that growth should pick up again from mid-2009, but as more and more waves of data come rolling in this looks increasingly unlikely and the Spanish economy seems set to contract all through 2009 and probably shrink again in 2010. 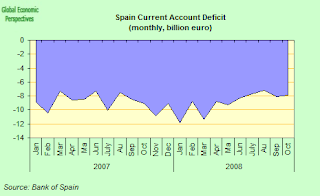 One of the reasons why there is little room for optimism in the Spanish case is the need to correct the current account deficit, which, while it is now steadily falling back as internal demand weakens, is still running at something like an 8% of GDP annual rate. The deficit dropped again in October, according to the latest data from the Bank of Spain, hitting 7.86 billion euros, down from 8.11 billion euros in September and 9.02 billion euros in October 2007. As can be seen in the chart (below) the deficit has now been dropping steadily since March last year. The driving force behind the fall is more a question of declining imports than rising exports though, and, please note the very important point that the income account, which is the net balance of interest paid on loans and dividends on equities, still continues to deteriorate. 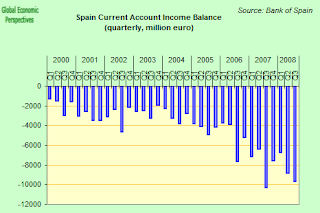 The deficit on income account was 3.53 billion euros in October, up from 1.77 billion euros in October 2007. The reason for the deterioration in the income account isn't that hard to find, it lies in the growing external indebtedness of the Spanish economy (see chart below). This debt has now risen from 870 billion euros in Q3 2004 (or around 90% of GDP) to 1,686 billion euros in Q3 2008 (or around 155% of GDP). In fact the size of the debt has more or less doubled over this period, and it is still rising. The reason for the increase in debt isn't hard to find, since it lies in the need to attract funds to finance the large increase in the goods and services trade deficit which was created by attempting to run the Spanish economy so far above what could be termed its "capacity", and for so long. So basically Spain's problem isn't simply a construction boom that went wrong. Spain's current economic malaise has deep structural roots that go back over a number of years - probably the best part of a decade. 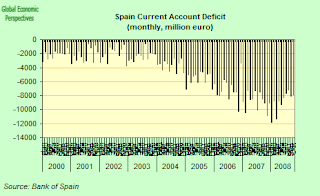 Basically Spain's economy overheated way beyond capacity for at least six years, and the smoking gun for this is what happened to the current account deficit (see chart below), as imports were steadily sucked in to meet the voracious demand, that was, of course, fuelled by the large rise in construction activity and the wealth-effect of steadily rising property prices. 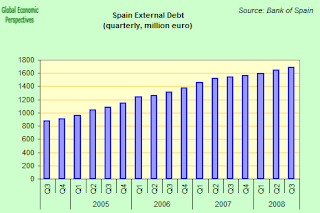 And how, apart from the CA deficit, do we know that Spain's economy was operating "beyond capacity" - well one piece of evidence would be all that external debt which was accumulated by the inflow of foreign funds (which you can see in the earlier chart), and another would be the large number of migrant workers who were sucked in. 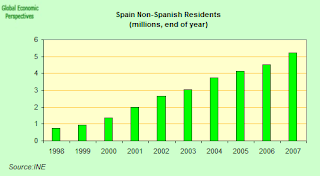 There are currently something like 5 million immigrants living and working in Spain, and they make up about 10% of the population, the highest proportion (of first generation immigrants) in the European Union. Even more strikingly, more than 4 million of these immigrants came to Spain after 2000, during the good years of the housing boom, they filled the toughest and worst paid jobs on building sites and farms. So there you have it, an economy is basically a large cement mixer into which you throw money, people and raw materials in certain proportions - and out the product (national income) comes at the other end of the pipe. But Spain had neither the people, the money, nor the energy to fuel all this, hence all of these were imported, and in large quatities. Hence, ultimately, the CA deficit. Not all that hard to understand really I don't think. But why did the economy overheat? Aha! Well just look at the chart below, and notice how the period when Spain was being subjected to negative interest rates coincides almost exactly with the sudden surge in the CA deficit. This is another tell-tale sign, another smoking gun. 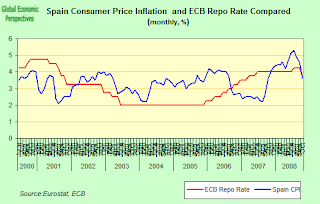 The monetary policy applied in Spain between 2002 and 2006 was thoroughly inappropriate. But now is not the time to quibble about this - when things are back under control again there will be plenty of time for a post mortem. Now is the time for action, and for doing something to try to ensure a more orderly correction than the one we are currently "enjoying", and it is this plan of action I find lacking, far more lacking than the mere absence of reflective self criticism. Finally, (below), one last chart on Japan, again prepared by the Japanese economist Richard Koo. 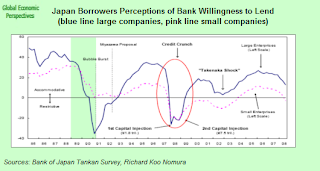 The thick blue line (please click over chart if you can't see adequately) shows the perception of large businesses of the willingness of banks to lend to them, as surveyed by the Bank of Japan for the Tankan index. You will note the line plunges twice, and it is the second plunge, or "credit crunch", which interests me at the moment. This was the crunch that finally drove Japan decisively off into deflation, and produced that now famed "liquidity trap". Basically the first credit crunch was resolved via large scale government contruction spending, the guaranteeing of bank deposits, and the swallowing by the banks of a large number of non-performing loans. Does all this sound familiar? It should. But then Japan reached a point were the financial system could struggle forward no further. 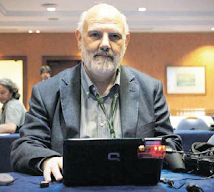 So the crunch broke out again, and this time the only way to resolve the problem was with two massive injections of capital into the banking system. These injections served to push the Japan government debt to GDP ratio sharply upwards, and it is this part of the story that I feel we will see repeating itself here in Spain. Maybe in 2010, maybe in 2011. It all depends how far the system can limp forward before it folds in on itself.